Meghan and Dan enjoy a quiet moment together on the shores of Lake George with the Adirondack mountains in the background at sunset. We made a little bit of time in the schedule to bring the couple together for a few minutes during the reception, taking advantage of their need for a break from all the business of their Lake George wedding reception. A wedding reception at Camp Chingachgook provides so many great opportunities for photos. There is the main structure at the pavilion. There are lawn areas and areas of woods which both provide places where we can take advantage of the great natural light. The top of the boathouse, often used for wedding ceremonies lakeside of Lake George, provides a great space to use for couples photos or group photos. And then there is the lakeside itself. The Adirondack camp has docks and shoreline, both great spots for photos. 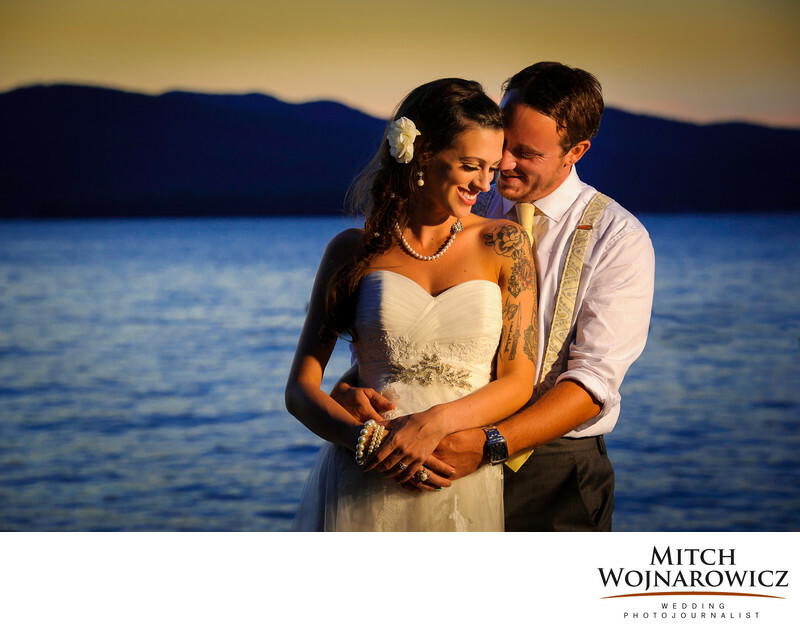 Looking for a Different Wedding Photographer in Lake George? Working with a Lake George wedding photojournalist, such as myself, means you’ll get lots of natural and natural looking wedding images. These photos won’t be the same cookie cutter images that you see from so many other wedding photographers. All of those other photos begin to look the same, with washed out tones, overly bright, all with the same Instagram-like filters on them that will make your photos look dated in a couple of years. Beautiful and natural looking wedding photos such as this one are the type that you’ll love looking at today and 10 years from now without cringing at how trendy-from-10-years-ago they look. I’d Love To Hear About Your Lake George Wedding! Just Click This Link To Get In Touch. We can speak a bit about your wedding, or maybe email a bit.